Business disruptions can happen at any time, and they often happen without any advance notice. 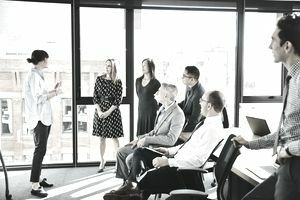 These unplanned events can take many different forms—natural disasters, loss of key personnel, data breaches, economic turns, cyber attacks, IT disasters—but the common thread is that the occurrence of these disasters has the potential to slow down, or even stop, your business operations. Disasters can impact every business. If you think your business is too small to be at risk, think again. If we consider only cyber security disruptions, a whopping 43 percent of cyber attacks specifically target small business. And that doesn't factor in all of the other types of disasters that can stop your business in its tracks. Knowing that more than 40 percent of businesses will never reopen after a disaster occurs, it is hard to argue with the position that you need to plan ahead for the unthinkable. As a business owner, you need to know exactly what to do to get your business back up and running quickly if something terrible happens. This is where a business continuity plan comes in. A business continuity plan proactively outlines that steps that you will take in your business to recover from (and in some cases prevent) disasters that may occur. The goal is to analyze potential threats, identify essential areas of the business that need to be focused on first, and clearly outline what should happen to avoid lost revenue or sustained business disruption. A summary of the most critical business processes and functions. A thorough analysis of potential threats that could disrupt business operations. A listing of both onsite and offsite emergency contact information. Clear instructions for accessing and restoring offsite recovery data. Identification of temporary business offices or locations. A change log that summarizes updates made to the plan and when they were made (for version control purposes). Every company, large and small, should take the time to create a business continuity plan. The complexity of your plan is dependent on the size, type, and location of your business, but if you are operating a business, you need to have a plan that outlines what you will do if something threatens your operations. A well-developed business continuity plan can protect every aspect of your business—data, physical business location and equipment, personnel, inventory, and intellectual capital. If your business faces a disruption, and you don't have a business continuity plan to mitigate the damage, you may lose revenue, essential personnel, competitiveness in the industry and even your positive public reputation. The bottom line is that a continuity plan is just as important as other types of business plans, so you should have one to protect your company should you need it. Use a template: All business continuity plans have similar information, so you can save yourself a great deal of time by downloading a business continuity template and then customizing it for your business. Give yourself a head start by downloading and updating this template from FEMA, or this one on TechTarget. Make it easy to execute: If your business continuity plan is disorganized and confusing, the usefulness and ability to execute in a timely manner will be limited. Makes it easy to understand and execute by including clear step-by-step instructions or checklists that outline exactly what needs to be done. You can also make it easy to execute by using visual aids such as flow charts, graphs, and diagrams to demonstrate the actions that are necessary. Pad the estimated recovery time: A business continuity plan involves making assumptions and estimates about what could happen, what will need to be done and how long it will take to recover. One way to ensure you have enough time to get the business back on track is by adding in extra recovery time to get back up and running. This can give your business a little breathing room during the recovery phase. Test it thoroughly: Avoid creating your business continuity plan and just hoping for the best. You should test it out and plan several run-throughs to make sure all of the most critical business areas are incorporated and planned for adequately. Update the information regularly: Don't let your plan sit and collect dust. If you invest the time to create a business continuity plan, you should also spend the necessary time to make sure it's accurate. Schedule regular check-ins (at least every six months) to review and update all of the information included in the document, including personnel, contact information, locations, and strategies. Share it with key personnel: Everyone who has responsibilities in the business continuity plan should be aware of them and have a clear understanding of the roles they will play in executing the plan. It many cases, it will also make sense to keep other personnel on a broader level updated so they can jump in and assist if necessary. Provide training to support the plan: Proper execution of a business continuity plan may require that some of your staff go beyond their day-to-day responsibilities to complete additional tasks. Make sure you take the time to train each of these employees on what they need to do, so there is not a knowledge gap if the plan needs to be put into action. Once your business continuity plan is created, you should also develop a disaster recovery plan that you can execute to get your operations back up and running if a disaster occurs.